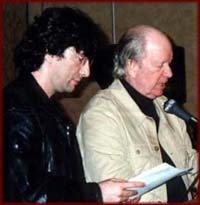 Neil Gaiman and Gahan Wilson presented the INTERNATIONAL HORROR GUILD awards recognizing outstanding achievements in the field of horror and dark fantasy from the year 2001 Saturday evening, April 13, 2002. The event took place during the World Horror Convention at the Radisson O'Hare near Chicago, IL. The Design Image Group sponsored the awards this year. The previously announced recipient of the Living Legend Award, William F. Nolan, was also presented his award. The INTERNATIONAL HORROR GUILD also named prolific multi-genre author William F. Nolan as this year's Living Legend Award winner. IHG Living Legends are individuals who have made a meritorious and notable contribution and/or have substantially influenced the field of horror/dark fantasy. 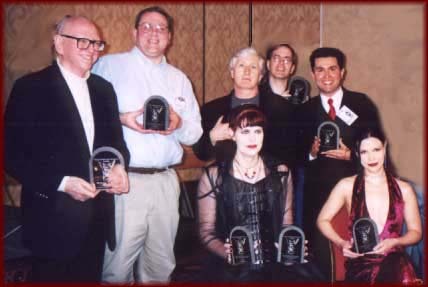 Previous recipients are Alice Cooper, Ray Bradbury, Clive Barker, Hugh B. Cave, Edward W. Bryant, Richard Matheson, and Harlan Ellison. Rain Graves (accepting for David J. Schow, nonfiction).